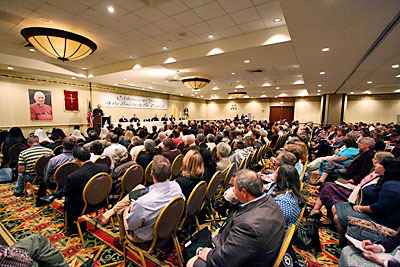 Over the weekend of October 15-17, 2010, Angelus Press hosted its first annual conference in Kansas City, MO. On the occasion of the 40th anniversary of the founding of the Society of St. Pius X, nearly 700 people convened at the Hilton Hotel near the Kansas City airport for three days of talks, socializing, and mutual support. Bishop Bernard Fellay, the Superior General of the Society, was the keynote speaker and offered a pontifical High Mass Sunday morning at the historic St. Vincent de Paul church. Fr. Arnaud Rostand, District Superior of the Society in America, made the decision to hold such a conference nearly a year before the event took place. His intention was to celebrate appropriately this milestone in the Society’s history, organizing the weekend around the theme of fidelity to the vision given it by its founder, Archbishop Marcel Lefebvre. On Friday evening, during his introduction, Fr. Rostand recalled to us the meaning of gratitude and placed the weekend’s talks in this light as signs of our gratitude to the Archbishop. Fr. Juan-Carlos Iscara, a professor of history from St. Thomas Aquinas Seminary and former District Superior of Mexico, was the first speaker. Appropriately, he shared his insights into the life of Archbishop Lefebvre, especially noting the various Popes whose pontificates shaped his life. He stressed how it was his fidelity to the Magisterium which dictated his decisions and helped him navigate the stormy waters of the post-Vatican II pontificates. After this talk the guests had a chance to introduce themselves to one another, eat some food, and visit the information tables. Among the latter were counted Our Lady of Guadalupe Monastery, St. Thomas Aquinas Seminary, the Dominican Teaching Sisters, the Franciscan Teaching Sisters, the Sisters of the Society of St. Pius X, the Third Order of the Society of St. Pius X, Notre Dame de LaSalette Boys Academy, the Society Retreat Houses, St. Mary’s Academy and College, the Eucharistic Crusade, the Archbishop Lefebvre Documentary, and the Legion of Mary. These various groups and apostolates demonstrated the growth and fruitfulness of the work of Tradition in America. Beyond the 600 plus laymen who arrived, the conference was notable for the amount of clerics and religious in attendance. St. Thomas Aquinas Seminary, in addition to sending three of their professors, sent 16 “theologians”, or seminarians in their final years of study, including the deacons. Father Cyprian was accompanied by two Brothers from Our Lady of Guadalupe Monastery. The Sisters of the Society came both from their house in St. Mary’s, KS, but also from their novitiate in Browerville, MN. The Franciscan Teaching Sisters, native to Kansas City, were present (and hosted most of the clergy and religious in their immense convent!) And all of this is not to mention the many priests of the Society who came from across America, Canada, the Philippines, and India. Although many of them had to leave Saturday to take care of their missions, and in addition to some diocesan priests who attended, the attendees saw as many as 70 cassocks or habits during the weekend! At the end of Friday night, the boys from Notre Dame de LaSalette Boys, under the direction of their music teacher, Mr. Bill Boyer, provided a surprise musical performance for the attendees. Showing their breadth of talent, they performed some polyphonic pieces, some Gregorian chant, and some secular songs, including the school fight song. The edifying and inspiring performance fittingly ended the first day. Saturday was the most intensive day as far as talks went. John Vennari, editor of Catholic Family News, began the day by recounting Archbishop Lefebvre’s role at Vatican II. This included, of course, not only the work on the preparatory committee, but his role in organizing the resistance at the Council itself. Fr. Kenneth Novak followed this by a talk on the Mass, and its centrality to the vision of the Archbishop and the Society. Large cheers were heard when Father pointed out that anyone saying or attending the traditional Mass today can thank the Archbishop, whose resistance alone maintained this treasure for the Church. The final speaker Saturday morning was Fr. Scott Gardner, who discussed the Archbishop’s doctrinal problems with Vatican II and pointed out how the Society maintains these objections to this day. 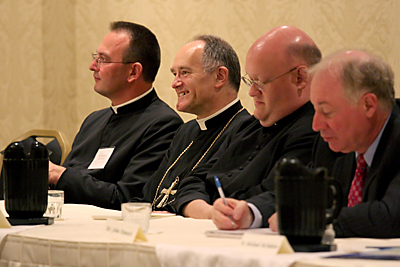 After a break for lunch, the afternoon was taken up mainly by the talk of His Excellency Bishop Fellay. For over two hours he captivated the audience, telling the crowd both about the reality and depth of the crisis in the Church, but also about the hope given to us by the Archbishop, commenting on his Spiritual Journey. He concluded with some news about Rome and the doctrinal discussions, explaining how conflicting things coming from Rome show that two trends there are clashing. The Society, however, is seen with greater interest than previously. On Saturday night, a formal dinner was served to over 500 guests. During dessert, a slideshow history of the Society was narrated by Dr. Andrew Childs, Associate Dean of St. Mary’s College. His operatic background proved useful as he brilliantly recounted 40 years of this exciting chapter of the Church’s history. Sunday morning was the occasion for the pontifical High Mass at St. Vincent de Paul. This magnificent church, once referred to by the Archbishop as a “cathedral”, is one of the jewels of the US District. For many faithful from smaller chapels or missions, it was a unique joy to be able to attend Mass in such beautiful surroundings. In addition, the seminarians served the beautiful liturgy and the choir and schola of St. Vincent’s provided their musical expertise. The splendor of the liturgy was made manifest in every way. St. Vincent’s Academy, right next to the church, hosted a brunch after the Mass. Their wonderful preparation and assistance was an opportunity for the attendees to get a further glimpse into the Society’s work in Kansas City itself. Everyone returned to the hotel afterward for the afternoon conferences. 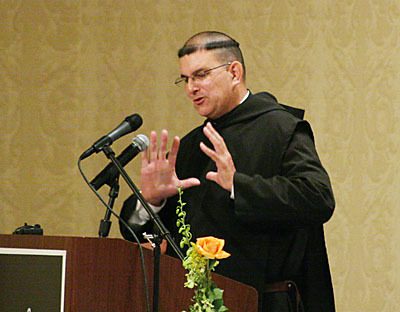 Father Cyprian, the Benedictine prior of Our Lady of Guadalupe Monastery, gave the first talk. His theme was a perhaps neglected part of the Archbishop’s life: the fact that he was a religious. Recalling his religious vocation, he upheld the religious life as the ideal of the Christian life itself and pointed out the various religious orders that work with the Society in the combat for Tradition itself. Fr. Michael McMahon, Headmaster of Notre Dame de LaSalette Boys’ Academy, was the final speaker. Through the life of Archbishop Lefebvre, he emphasized the quality of family education. Further, he pointed out that the Archbishop’s formation at the Sacred Heart Seminary in Rome was a providential preparation for the man who would pass the torch of the priestly ideal, a key element of a restoration of Church and society, into the 21st century. Fr. 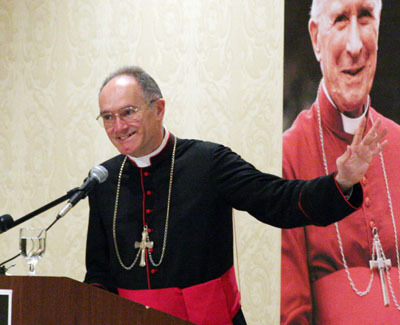 Rostand concluded the conference by presenting a spiritual bouquet to Bishop Fellay. In addition, he announced that, in order to preseve the crusade for the Faith, the Mass, and Christian families, the conference would become a yearly event. After much applause, he announced that the 2011 conference will be held from October 7-9 and that Bishop Tissier de Mallerais will be the keynote speaker. 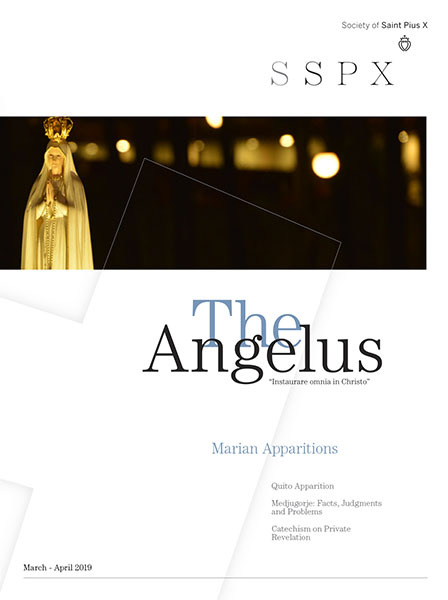 Further information, and recordings of the talks, will be available from Angelus Press in the upcoming months.